I am developing a great fondness for crime novels and thrillers set in Scotland, often referred to as Tartan Noir; I especially love Christopher Brookmyre. When looking for something suitable before Mr B’s next novel, I came across Stuart MacBride, largely by accident and simply because I liked the look of the paperback cover for his first novel, Cold Granite. I enjoyed it so much that I had ordered the sequel before finishing it. 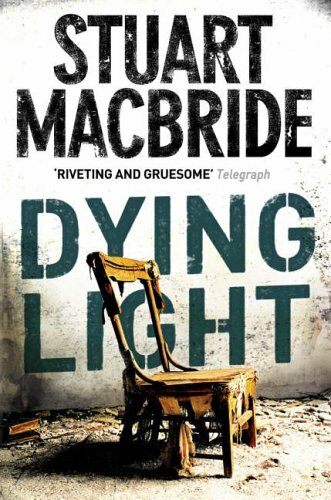 Dying Light is once again set in Aberdeen and features DS Logan Macrae; things are not going well for him in this novel and he has been assigned to work with DI Steel in the “Screw-up Squad”. I won’t go into the plot, but it is gruesome and very satisfying. I particularly enjoy the dark humour which runs through the story and found myself giggling more than once. I love the reminder that almost everything we see on TV crime is English or US law and that there is no right to counsel in Scotland until after the police interview is complete, so asking for your lawyer is a bit redundant. I can highly recommend this, and am looking forward the the third book in the series which should be with us soon.